A pure catharsis in the making. 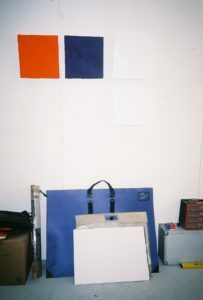 Artist Florence Sweeney is particularly curious about creating a visual and tactile language with her use of materials. Her works are drawn to a tactile component, yet behind the surface; raise larger questions in relation to life and mortality. She plays with these ideas within the context of her abstract works, which are kept quite ambiguous by merging painting and sculpture, conceived notions of “masculinity” and “femininity” or the heavy and the light. We spoke with Sweeney in anticipation of her group show at Espositivo, Madrid, where she will develop new works with steel, latex and concrete into “voids”. Florence Sweeney (b. 1991, London Essex, UK) graduated in Fine Art from Arts University, Bournemouth. 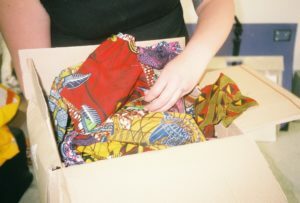 She has exhibited widely in the UK at Studio 90, London; Lily Brooke Gallery, London; The Dot Project, London; Brains & Lips, London; Safehouse 2, London, amongst others. Residencies include Espositivo Residency, Madrid and the Instagram residency at Shelf London. She has been awarded The Eaton Fund Award. Florence Sweeney currently lives and works in London. You studied illustration at Bournemouth, and in our latest visit to your studio, you mentioned that at that point of your career, your work was “too personal”. Is your current practice aesthetically driven as a way to avoid the viewers from identifying personal connotations? When I decided to study Illustration, subconsciously I was pushing away issues I needed to focus on, and thought that choosing a pathway that could leave to employment after university was a smart decision. I hated the course and felt suffocated in a way I couldn’t express myself to which I moved to Fine Art. 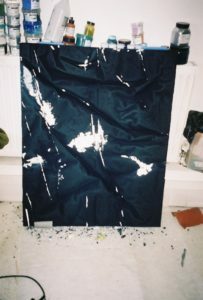 I didn’t hold back, and developed a practice that was very confessional and researching into contemporary drawing, my personal themes were perhaps quite strong and it is hard to commit to that level of openness all of the time unless you’re Tracey Emin. After graduating uni in 2014, I had a year where I solely read books, write, and left the making until moving to London in 2015. I got a job in a hardware shop in Stoke Newington, which gave me the opportunity to be able to afford a studio in Hackney and have discount on industrial materials. This gave me so much space to experiment, and I fully enjoyed making material based works giving me a new aesthetic, and my research projects to be picked up when the time is appropriate. I developed my materials when desiring a different result, so moving from concrete to Jesmonite, household paint to pigment, fabric to latex. 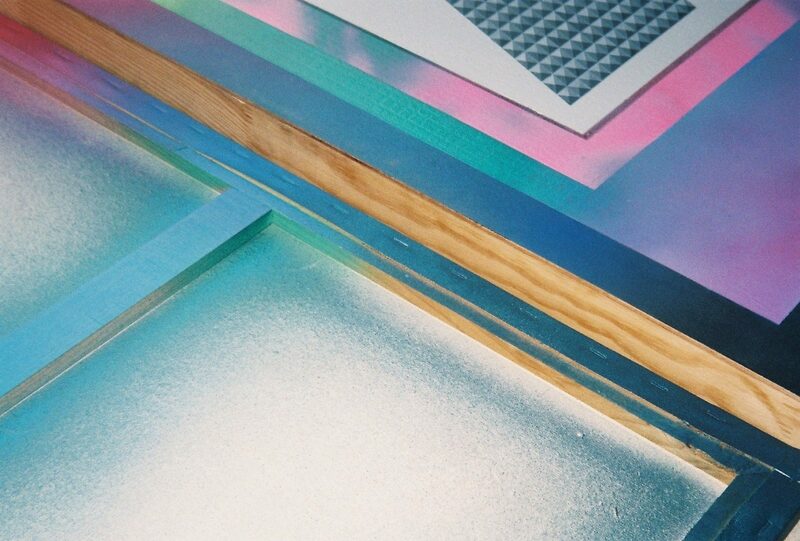 I developed a visual and tactile language with these materials, which gives me pure catharsis in making. The opportunity to be more ambiguous and space to think, connect and apply the various influences I’ve been reading, writing and personally experiencing. I am now leaning to open up within my work, as coming back to a previous project of art and psychoanalysis I’m finding the time is right now. I had the pleasure to see your “relic” latex work hung at your studio. Why is this work – made in 5 minutes- so important to you? Do you reference this piece within your entire practice? I’m little bit of a hoarder when it comes to materials. I have various types of rope, fabric, plastic, weird tubing, foam, fragments of colour, found objects in ordered chaos in my studio waiting to find their purpose. 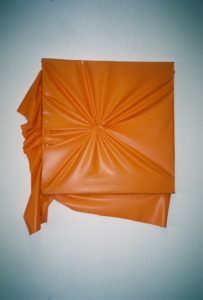 I bought this orange latex some time ago as I was drawn to its colour and the lurid sheen it has. I have it on my studio wall as it reminds me that very quick creations can have importance. Whilst I hadn’t achieved anything in that day in the studio within 5 minutes, I thought what if that latex was attached to that old frame that’s been discarded in the communal area… the latex is so artificial yet it can drape in a pleasing organic way. The minimal of material and process gives it a simplicity, which I think, can be hard to conjure if overthink. I understand your mum was an artist, and one of your first works explored her DNA. Can you explain us about this project further? I am interested in the idea of Nature vs. Nurture and what do we inherit from our biological parents, does our DNA define our future? When growing up I didn’t know much about my mother and was afraid of being like my father. I was extracting my own DNA from salvia, a locket of my mother’s hair and various bodily tissues and looking at it under a microscope and seeing an abstraction of cells and fibres. It was only when I found her sketchbooks and paintings in storage I realised we had the same style of drawing, nuances and eye. I felt an immediate connection and started to contact people she knew from art school for photos of her or stories. Do you consider that your strong work experience for established artists such as Idris Khan, Yinka Shonibare, or Sandra Shashou feeds into your practice? It has definitely helped me to understand how the art world runs, and perhaps has taken away some of the illusion of it all, which is actually probably a good thing. Some people have a romanticised idea of how art is produced, when it’s really a group of artists like myself making it, so it’s nice to be around other artists. It has helped me in understanding how works are fabricated, how studios run, and how artists have gained their successes. Your practice blurrs the line between the artist and the fabricator – and is very much process/material based, often using hardware store products. From concrete to marble dust, passing through rabbit skin, jesmonite, foam, resin, or latex. I’d like to know more about your choice of materials and the contrasts between these? Materiality is a key component of my work and tactile materials is something I’m drawn to. 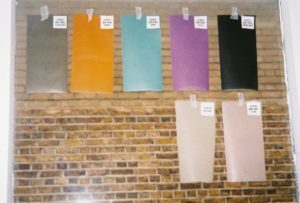 With these materials they are generally process based production, that being milling the pigment and blending the colours or casting concrete, Jesmonite or latex. The contrast of organic next to manmade materials creates texture and context. The masculine/feminine aspect comes into play with this too. I don’t want to generalise but from my experience I’ve seen men like slick high fabrication artworks with metal, black or monolithic. Women have been associated with either ethereally sensitive art (not that theres anything wrong with that and apart of my work is that) – it’s boring to have assumptions of what work you make due to your gender so I blur the lines with the presentation. I am particularly lucky that my brother in law is a fabricator/framer, there is no way I could afford those aluminium frames three years ago! Back then I would come to his studio in Stratford and like any annoying sibling (in law) I’d ask if what was lying around being used and if I could have it. Later that led me to trying out new ideas like ‘Veil Between Us’, which broke away from the paintings into sculpture. You define your practice as “laying in-between painting and sculpture”. Yet your works appear to also position themselves in between the masculine and the feminine, the heavy and the light- is this duplicity intentional? In my work I do channel masculine and feminine energy with the materials but it is also reflective in myself. I was aware of my boyish side whilst growing up as a ‘Tom Boy’ (and I hate that phrase…) but I guess when reaching maturity I began to understand what it is to be a woman and how being treated differently to boys is unfair. In my work I play with materials where it can be super slick in aluminium tray frames, steel plinths or concrete which has masculine appeal but then set inside yonic forms, draping pinky fleshy latex and bunched up folds. It is a duality of myself as I do feel quite masculine in my demeanour but also feminine and I would rather have both essences. What is the role of poetry and language in your practice? Why is this aspect of your work left unrevealed to the public? I wouldn’t say I read much poetry but I am interested in the poetics of language. Writing is important to my practice as it allows me to place out my ideas and the links in between. I have an electric typewriter in my studio in which I tend to use when I come into the studio, it may start at first running off thoughts and aggravations which then lends me to find that space where I can concentrate on deeper thoughts. I have a letter-based project that may take several years before I reveal as the situation is still currently on going and some artworks aren’t made for instant exposure for the public but self-expression to understanding the situation. Sophie Calle is an influence for me as she breaks down events that have happened in her life in ways of understanding it in different perspectives, which is something similar for me. You presented a series of foam works in your recent solo show “Of Other Places” at Studio 90, London- curated by Alexandra Wilmott and Tom Wilmott. I am interested in knowing more about your choice on the square format, given its familiarity to the arrangements we find day-to-day through Instagram? What about the dynamic curation of these pieces? These square pieces are smaller than my usual portrait size paintings and I wanted them to feel like objects as they are floating from the wall. Reducing the size into being like tiles the pieces were exploring new processes with foam, heat tools and new pigments such as malachite and irzagine orange. 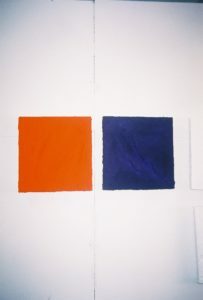 As I knew in the exhibition it would be a series of smaller paintings the square format gave the pieces a balance, with Wilderness Projects we played with different arrangements with the boldest orange piece being distant and the three white pieces in a column which elevated the work nicely. Would you agree in saying that behind the surface, your work seems to pose bigger questions in relation to life and mortality? Yes it does. There are many questions that I won’t know about my life as the sources are gone and I do not know much about my own source that I came from. I can get a bit existential and creating abstract work allows me to play with these ideas. ‘Of Other Places’ were looking a metaphysical landscapes, foreign terrains, uncharted territory, the unknown. It is hard to talk about these themes when trauma is a big part of it; lately I have been going to artist talks at the Freud Museum for the exhibition ‘Breathe’ with artists Fay Ballard and Judy Goldhill. It was extremely refreshing to be amongst an audience who were opening up about their experiences and art practice and psychologists giving perspectives. I suppose its all about finding the courage and confidence to go that deep with my work, but you can see why I like ambiguity. Your textile works seem very physical yet intimate at the same time. Do you think there is a subconscious sexual aspect manifested in these works? Your inspirations vary from books you’ve read to artists you’ve seen – can you reveal some of these inspirations to us? Rebecca Solnit is a fave – she is a brilliant forward thinking feminist who writes in a poetically philosophical way. I’m reading Roland Barthes’s “Mourning Diary” to “Art, Death and Lacanian Psychoanalysis” and “Art and Mourning” some fun topics there… An artist that I am currently focusing on is Eva Hesse, as she has an interesting background and great sensibility with raw materials. Marguerite Humeau I’ve been following for some time, and I went to her talk at the Hayward Gallery recently. It was fascinating to hear about Humeau’s extremely big projects with high level fabrication and how they are executed, but also how there are personal themes in there, but Humeau has created a different reality for this narrative to exist. For the show in Madrid I am going to create a new body of work which shall also be my project ahead. I shall be focusing on my sculpture pieces such as ‘Viel Between Us’ and developing those ideas with steel, latex and concrete into ‘voids’. The artists I’m exhibiting with are Esther Gaton and Ana de Fontecha, who have a heavily material process-based practice, which my work will correspond, nicely in the gallery. We’re about to start discussing concepts, and the exhibition is in Madrid 21st November 2018.